Pulitzer Prize-winner John Kaplan shows you how to edit to your strengths and prepare a stunning portfolio that eliminates doubt in the minds of editors, buyers and contest judges. Hands on examples from top photographers and inside advice from leading agents will give you an important edge that can land your portfolio on top of the stack. Each chapter highlights crucial strategies that will significantly strengthen your portfolio, including tips for PHOTOJOURNALISTS, FREELANCE COMMERCIAL AND FASHION shooters, WEDDING PHOTOGRAPHERS and NATURE & WILDLIFE and FINE ART specialists, too. Quickly get your portfolio onto the web without the hassle of confusing computer programming. Dramatically improve your portfolio through the power of smart editingjust follow the author’s step-by-step guide. Weed out weaknesses to build a portfolio that will win contests as well as assignments. Learn what today’s editors, buyers and curators look for. Rise far above the pack by creating a portfolio with the essential vision that clients demand. Get your foot in the door and keep it there for a winning impression, long-term sales and client relationships. Increase sales with savvy marketingonline, in-the-mail, or in person. Whether you are an aspiring professional, student, advanced amateur or seasoned pro, PHOTO PORTFOLIO SUCCESS is your key to a satisfying and truly successful future in photography. 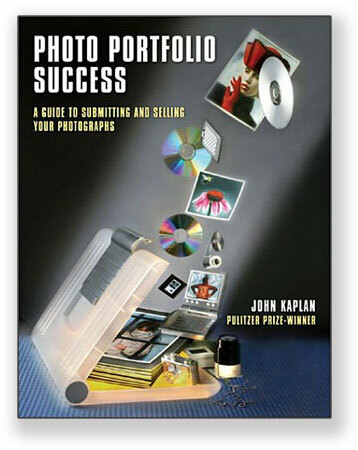 John Kaplan has been awarded many of the top honors in photography and so have those he has coached on portfolio development. Kaplan has won the Pulitzer Prize, National Photographer of the Year, the Nikon Grant, Overseas Press Club and the Robert F. Kennedy Award. An associate professor at the University of Florida, he is asked to teach photo workshops and seminars around the world. He exhibits at museums and galleries worldwide and his freelance work has appeared in numerous book annuals and magazines. Kaplan's former students and those he has worked with on portfolio development have also won top honors, including the Pulitzer and College Photographer of the Year. INCLUDES BONUS ONLINE PORTFOLIO GUIDE! Learn more about Photo Portfolio Success.